Many people now choose Celtic wedding bands to mark their union. There are many ideas as to their true meaning. However we like these the best. 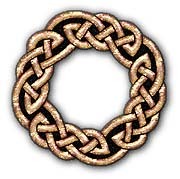 Over time archaeologists have determined that the outer shape of a knot is key to the overall meaning and have recorded a key of sorts to aid in determining the context of Celtic designs. These are shield knots considered symbols to ward off evil spirits or bad intentions. 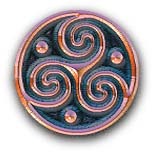 Spirals, whether in single form or multiple spirals together, represent rebirth or life cycles. When humans or animals are seen in a knot interlaced this can represent the struggle of man and nature, the dependence of man on nature, or represent relationships between man and nature or man vs. man. When circles are present in a knot this is considered to represent eternity or the eternal cycle of life and death.